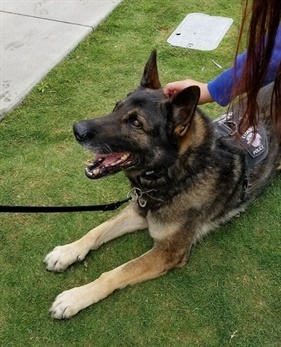 Spirits were down at the Orange (CA) Police Department on Thursday as officers mourned the loss of one of their top K-9s, Bosco, who was euthanized late Wednesday after it was discovered he had a serious medical condition, police said. Bosco, a 9-year-old German Shepherd, joined the OPD in August 2013. In less than 5 years of service, Bosco participated in more than 500 searches and racked up more than 60 arrests, including a number of dramatic pursuit finales. He also assisted in recovering large amounts of illegal narcotics and currency, Orange police Sgt. Phil McMullin told the OC Register. Late Wednesday night, Bosco was demonstrating flu-like symptoms and was taken to the vet. Within hours, he was taken to an emergency room in Yorba Linda and it was discovered he had a severe medical condition. The situation was assessed and a tough call was made to have him euthanized, McMullin said.